Electronic Cigarette World, Australia brings you the Kangertech KBOX 40W Sub Ohms Mod - Kanger's first Box Mod. The KangerTech KBOX is designed for vapers who are new to mods. Any beginner can enjoy all the advantages of a variable wattage box mod without spending too much. Introducing Kangertech's first Box Mod. The Kanger KBOX makes uses of lightweight aluminum chassis to provide you with a lightweight, but sturdy and durable sturdy mod for everyday use. It's compact size makes it very portable. The KBOX has an ergonomic design that is meant to be comfortable in your hand throughout the day. This mod feels great in the hands and the simple 7 wattage settings makes this ideal for a beginner. The Kanger KBOX features a simple wattage setting that may be adjusted from 8W, 13W, 20W, 25W, 30W, 35W or 40W. The KBOX is easily adjustable to your personal preference with a simple press of a button. The KBOX can fire all atomizers down from 0.4 ohm and higher, will suit those looking to enter the sub ohm craze for use with the popular Kangertech Subtank also made by Kanger. 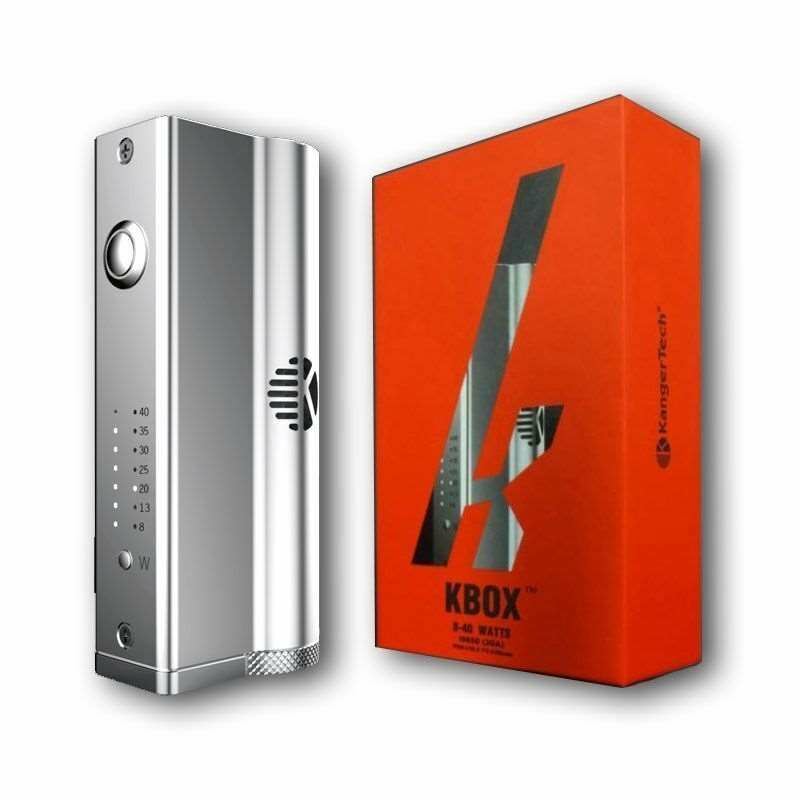 The Kanger Subtank series and Aspire Atlantis are highly recommended with the KBOX. The sleek aesthetics of the KBOX complements these tanks perfectly. The Kanger KBOX safety features include a heat dissipation hole, short circuit, and over-current production. The KBOX is 510 threaded and requires 1 x 18650 High Amp battery (not included). The battery is easy to replace due to the twist-off tail cap. It is recommend a suitable battery is used, one which is capable of at least 20A constant discharge. Note: Battery and Tank is NOT included in this kit. The user must purchase a suitable 18650 battery with output of 20A or above.